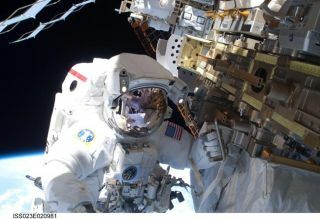 NASA astronaut Rick Mastracchio helped upgrade the International Space Station during space shuttle Discovery's STS-131's mission in April. A group of nutrients found in fish oil, known as omega-3fatty acids, may help mitigate bone breakdown that occurs during spaceflightand in those who suffer from osteoporosis, a new study suggests.? As NASA sets its sights on long-durationmissions to Mars and an asteroid, scientists are working hard to understandand cope with medical issues, such as bone loss, that accompany and are likelyexacerbated by lengthier space travel. The NASA-sponsored study built upon decadesof research that has examined ways to halt bone density loss in astronauts.The study's findings could have significant implications for space travelers,but also for those who are susceptible to bone loss here on Earth. The space agency has studied bone loss because it is one ofthe main effects of exposure to weightlessness in space. "Your body is very smart, and it adapts to whateverenvironment you're in," study co-author Scott Smith, a nutritionist atNASA's Johnson Space Center in Houston , told SPACE.com. "For instance, ifyou start carrying around a backpack with 50 pounds in it, your skeleton willadjust to support that weight. The same is true for spaceflight. Your bodyknows that it is not carrying around the normal amount of weight." So, if a person is in space for long periods of time, thebody is likely to perceive the state of weightlessness to be more permanent,which could put that person at risk of elevated levels of bone deterioration. The actual rate of bone loss for astronauts in space isdifficult to quantify, Smith said, because it varies from person to person. He roughly estimates that about 1 percent of bone mass islost per month in space. In comparison, a post-menopausal woman withosteoporosis has a rate of bone loss of roughly 1 percent per year, Smith said.? The study's findings are detailed in the May issue of theJournal of Bone and Mineral Research. ? The researchers conducted a series of studies that examinedthe effect of adding a specific omega-3 fatty acid, called eicosapentaenoicacid (EPA), to regular bone cell cultures and those designed to mimic weightlessness. Scientists documented that adding EPA inhibited theactivation of factors that lead to bone breakdown. This inhibited factor isknown as "nuclear factor kappa B" or NFKB. NFKB is involved in immune system behavior and theinflammation process, and if activated in different tissues, can lead to boneand muscle loss. In their study of astronauts who returned fromshort-duration shuttle missions, the researchers found that NFKB activation wasincreased in blood cells collected at landing, and remained elevated for twoweeks. This provided evidence that inflammatory processes could be involved inpart of the body's adaptationto microgravity. The findings also suggested that by reducing NFKBactivation, this could serve as a countermeasure to bone density loss. The researchers also conducted a ground-based bed rest studyon 16 subjects with evaluations performed after 60 days. Bed rest is one way tosimulate some of the effects of weightlessness, including muscle and bone loss.In this study, less bone loss was correlated with higher intake of omega-3fatty acids. "These models on the ground are not perfect,"Smith said. "They're not exactly the same as spaceflight, but they allowus to do much more invasive, intense types of studies than you could ever doduring flight." Based on their findings, the scientists evaluated bone lossin astronauts and compared the results to reported fish intake during spaceflight.It was found that astronauts who ate more fish lost less bone mineral afterfour-to-six month spaceflights. Measuring fish consumption is not as accurate as determiningexact diet and omega-3 fatty acid intake, but these data were not available. Furthermore, it may be premature to conclude that thesolution to the problem is simply a matter of diet, Smith said. "In the studies that we reported, we found that therewas an association between the number of times [astronauts] ate fish in flight,and the amount of bone they lost after flight," he stated. "This begstwo obvious questions: is it an effect of omega-3 on bone? Or, is it that whenan astronaut was consuming fish, he or she wasn't consuming something else,like meat, that could have a negative effect on bone." To expand the current study, researchers will perform acontrolled experiment that monitors specific food intake in order to determineif it is possible to directly modulate a loss of bone density through diet. In the meantime, these findings have important implicationsfor those who are susceptible to bone loss here on Earth as well, Smith said. "At NASA, we tend to look at very healthy individualsin a very unique environment," he said. "When we find things aboutphysiology and nutrition, what it allows us to do is understand the basic bonephysiology without a disease component ? we're purely dealing with anenvironmental component. This allows us to see what is going on withoutconfounding factors." So, while they were found under extreme conditions, the cruxof the study's findings are applicable to everyday situations too. "The bone loss we see during spaceflight is acceleratedbeyond what we see on Earth," Smith said. "That acceleration allowsus to see changes that we wouldn?t normally be able to see, or would be muchharder to see. So, in space, we can observe changes in six months that wouldnormally take a multiyear feeding study to observe. It's sort of like time-lapsephotography."